J’s 7th birthday is on Saturday. That means a treat to bring into school on Friday, celebrating at home on Saturday, and a kid party on Sunday. As my dad would say, a pagan festival. Really, all of October is sort of looming. After the party there’s an out-of-town wedding and a big family vacation, and I’m not remotely prepared for any of it. Today I got an email asking if I’d help with a project in December, and I was like, yes, I’ll help, but do you promise that I won’t have to think about it until November, pretty-please? So, I’m just focusing on getting through the birthday for now. J wants artichokes as part of her in-school treat. She’s been talking about this for months. She is nutty about artichokes, although Cute W and I joke that it’s really just a delivery system for the dip (made from butter, lemon juice, & garlic salt). To prevent brutal disappointment among her classmates, we’ll produce a non-vegetable-focused item as well. The kid party is small, 6 kids invited. I sort of hate the timing of J’s birthday. Every year we have the same problem, because she’s just barely getting to know the kids from school. So, last week at Back-to-School night a very nice lady told me that her daughter has been talking about J nonstop, and had brought home her “What I love about first grade is _____” worksheet with “playing with J” written in the blank. At home I asked J about her new friend. “Who? Which one is she? I hardly ever even play with her,” she responded, perplexed. Well, I persisted, maybe we should invite her to the party? “No, thank you.” Okay, I concede, what about that other little girl we’ve been seeing so much lately, the one you seem to like? “I do like her. She’s nice. I don’t want to invite her to my party, though.” Ugh. Instead, she names two girls I’ve never heard of, and of course she doesn’t know their last names, and I am fortunate, at least, that my library volunteer gig allows me to sleuth out the prospective invitees. Phew. Meanwhile, J came up with a huge list of craftily ambitious treats and activities for the kid party, because she’s a mini-Martha Stewart. She’s spent weeks sifting through old issues of Family Fun and her kid’s cookbook collecting ideas, and after two years running with a fairy theme, she’s decided that she wants to go with a Halloween party. This morning I made a grocery list and had a small panic attack. By dinner tonight I’d scaled back: we’ll have the same cupcakes for Saturday and Sunday, one of the kid-party treats is moving to the in-school treat, and J entirely forgot that she wanted to have a dip-caramel-apples activity, and I’ve chosen not to remind her. At least I’m done with the gifts. 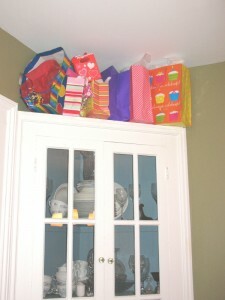 They were easy this year because she’s admired so many items that I’ve just bought and stashed along the way. 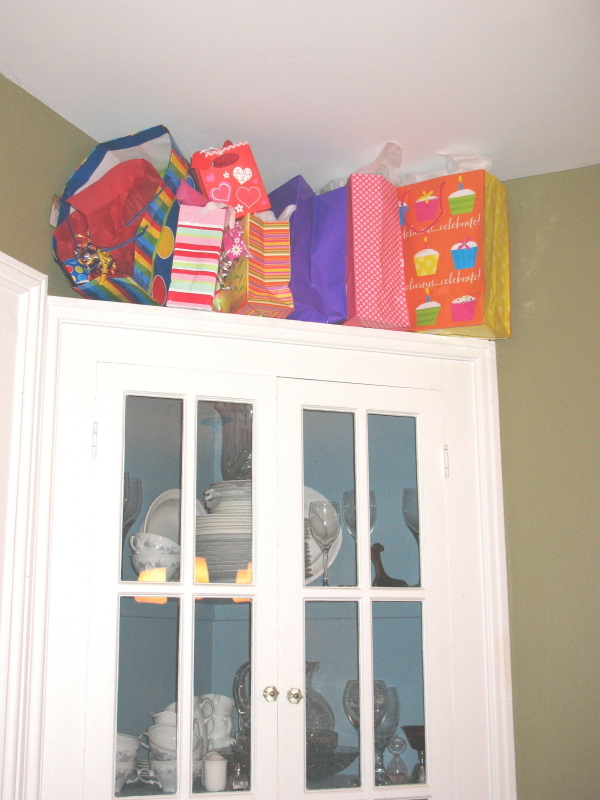 Our tradition is to perch the gifts up high, because I like those re-usable bags, and it’s just too tempting to have them within reach. Last night I finally wrapped them and filled the space above the china cabinet with our own and some relatives’ gifts, so this morning J, who’s been checking, squealed with joy. Let the pagan festival begin. Amy–We have the Southern Living Kids Cookbook, which I bought after plowing through a bunch in the section at my local store. I love that it has lots of pictures, and there’s a pretty good blend of healthy vs. unhealthy, basic vs. fancy items.